I’m a sucker for good stationery. I’ve even been known to travel for it (or coerce unsuspecting travel companions off the beaten path in the name of paper). It’s true. I discovered mac & murphy a few years ago while in Charleston for a wedding. 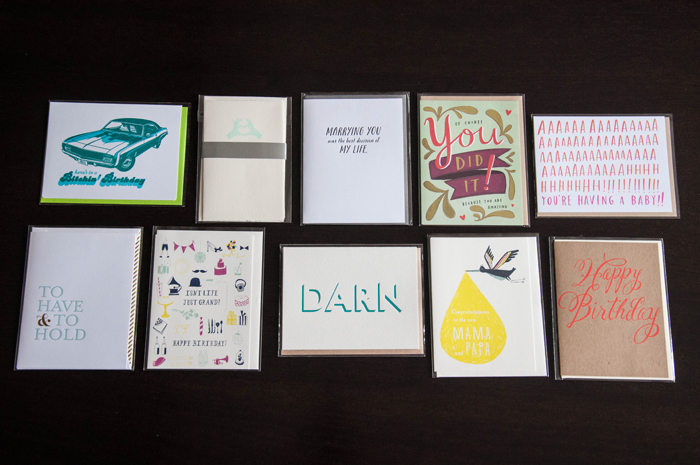 It’s a wonderfully curated collection of cards, pens and other stationery goodness just a few blocks from King Street. The owners, Liz and Ami are darling and have a great eye for pretty and clever correspondence. Best of all, they support local stationers like Ink Meets Paper and Slideshow Press. I was in town two weeks ago and swung by to stock up on some essentials. If you’re in the area, be sure to drop in. Oh and save room for dessert… Sugar Bakeshop is conveniently located across the street and they make the most delicious cupcakes. You can thank me later.